The Kingdom of Bhutan is located amidst some of the planet’s most outstanding natural environments. Yet communities are constantly reminded of their geographical vulnerabilities and challenges, increasingly exacerbated by climate change. For Phub Zem Doya, living in the remote village of Singye in southwest Bhutan, water is a precious resource – one not to be taken for granted. In her village, climate change has led many water sources to dry up, causing shortages particularly during the dry winter season. The land-locked country is exposed to a wide range of climate change-induced threats, including glacial lake outburst floods (known as ‘GLOFs’), flash floods and landslides, windstorms, forest fires, and seasonal water shortages (affecting not only people’s consumption, but also the viability of livestock and agriculture). Climate change is not solely driving more extreme weather events, it is also having a direct impact on the people who rely on subsistence agriculture. Fifty-eight per cent of the population live in rural areas and rely on agriculture for their livelihoods. This renders them dependent on favourable climatic conditions: if the weather is good, crops will thrive; if the weather is bad, crops will fail. As a result of water shortages, women tend to face greater hardship than men, because women have traditionally been responsible for water-dependent household duties, such as cooking, cleaning, and providing sustenance for children. Flash floods are a constant reminder of the threats of climate change. Photo: Wang Chhu river at Langjophakha, Thimphu. Recognising these climate-induced hazards, the Government of Bhutan and the United Nations Development Programme (UNDP) partnered and developed Bhutan’s National Adaptation Programme of Action (NAPA, 2006), updating it in 2012 to incorporate new emerging hazards. Since then, UNDP has partnered with the Government to formulate and support the implementation of climate change adaptation projects, based on identified priorities. With funding from the GEF-Least Developed Countries Fund, the first NAPA project, focused on reducing risks associated glacial lake outburst floods, was implemented between 2008-2013, the second NAPA project from 2014 to 2018, and the third under implementation since 2017. The second NAPA project guided communities, including Phub Zem Doya’s and Pema Dradul’s, to find durable solutions to water-related challenges. The project has made great strides. By partnering with the Tarayana Foundation, a local NGO, the project supported the construction of a climate-resilient water harvesting, storage and distribution system benefitting over 1,000 households in the districts of Pema Gatshel, Tsirang, Mongar, and Samtse. The rural communities of the four districts now have improved water supply sufficient for household uses, as well as for livestock and agriculture. Women and children have been the first beneficiaries, as they no longer have to endure long walks to fetch water. In turn, this has allowed many children to go to school regularly, and women are able to undertake extra income-earning activities in their new free time. The installation of a tap right next to Phub Zem Doya’s house was a huge step forward. Having ready access to running water transformed not just her daily routine – including her capacity to maintain proper hygiene and sanitation in her household – but also resulted in opportunities to earn extra income in the time saved. The improvement was marked also for Karma Lhamo, a farmer living in Tongshingang municipality: the new availability of water virtually on her door step meant she could maintain a kitchen garden as well as cattle rearing – activities previously not possible. Similarly in Mongar town, one of the country’s poorest regions with a persistent water scarcity problem, the project supported the construction of a new storage and distribution system benefiting over 6,000 households. Climate change adaptation continues to be a priority for the Government and has been given due emphasis in its current Five-Year Development Plan. Bhutan has also highlighted climate change adaptation in its Nationally Determined Contributions (NDC) submitted to the UNFCCC in 2015, with enhancing water security as the leading adaptation priority. 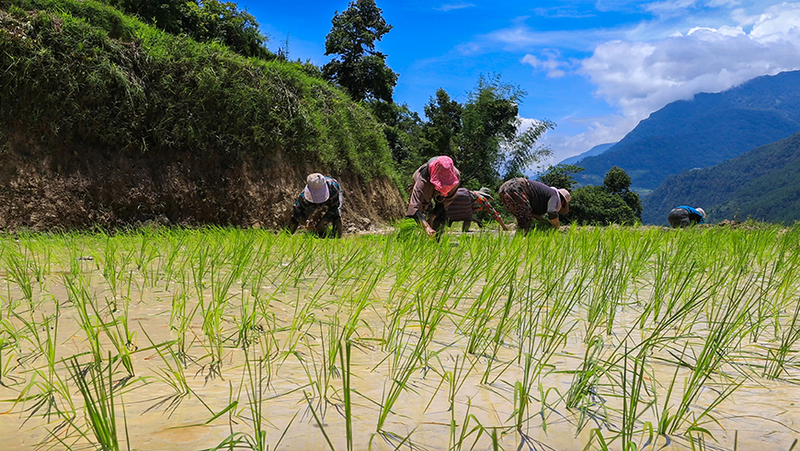 Bhutan is now prioritising long-term planning for climate change adaptation. With support from the Green Climate Fund and UNDP, the government will launch the National Adaptation Plan (NAP) Project in early 2019. The goal: to help the country build a stronger evidence base for adaptation through comprehensive assessments – looking especially at the issue of water, building of scenarios, study of indigenous and emerging adaptation interventions, and a stronger investment case for scaling-up adaptation. This story was originally published on Exposure by Climate Adaptation UNDP. Photos by Sonam Phuntsho/UNDP Bhutan except otherwise cited.